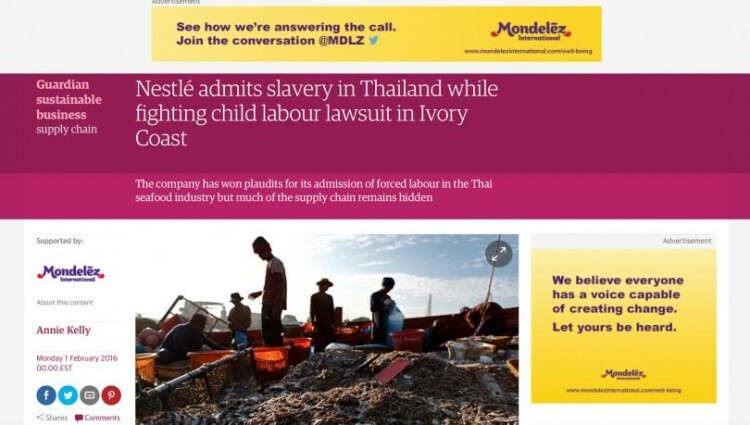 Mondelez, multinational company behind Kraft Foods and Cadbury, have sponsored a negative story which appeared on the US version of The Guardian attacking its competitor Nestlé’s use of slaves in Thailand. The story, headlined Nestlé admits slavery in Thailand while fighting child labour lawsuit in Ivory Coast, accused Nestle of “buying products tainted with the blood and sweat of poor, unpaid and abused migrant workers”. The article discusses the year-long investigation by Nestlé into its own supply chain in Thailand. The company found its seafood supply chain is “riddled with forced labour and human trafficking and that slave labour was involved in the production of its Fancy Feast catfood brand”. Just below the headline it’s clearly stated that the piece is “Supported by Mondelez International.” The article also features several banner ads from Mondelez, whose brands include Oreo and Cadbury, which state the company believes “everyone has a voice capable of creating change”. According to The Guardian’s commercial content guidelines, content which is ‘supported by’ a brand is different then articles which categorised as ‘paid content/paid for by’. Articles which are ‘supported by’ means the client may “have a role in suggesting what kind of topics are covered, but the commissioning editor is not obliged to accept ideas from the funder.